Kimora Lee Simmons couldn’t resist taking a shot at Lori Loughlin after her daughter got accepted to Harvard all on her own. 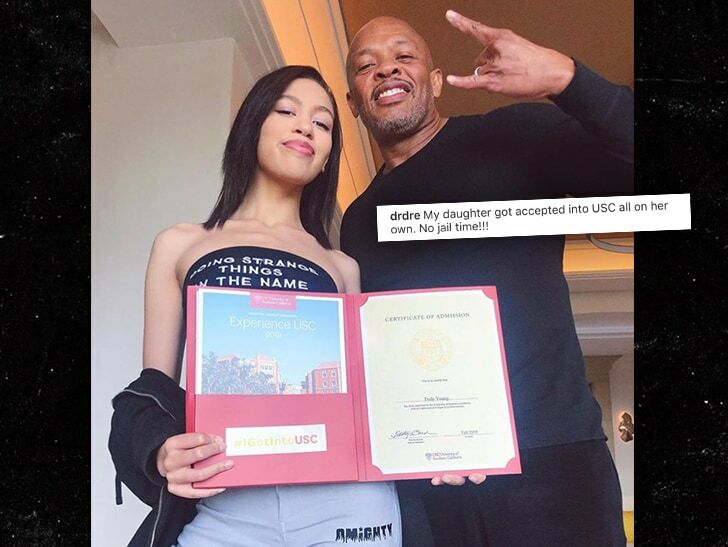 Russell Simmons‘ ex-wife just shared a video of their daughter, Aoki Lee Simmons, reading her acceptance letter into the Ivy League school … with Kimora adding some not so subtle jabs at Lori and all the parents swept up in the college bribery scandal. Kimora says she’s proud of Aoki for getting accepted to Harvard on the strength of her own merit … and not because she was on a bogus rowing team. As we’ve reported … Loughlin and her husband are facing criminal charges for allegedly paying $ 500,000 to have their 2 daughters designated as recruits for the crew team at USC — despite the fact they did not actually participate in crew. Lori’s daughters left USC after the scandal broke, and they could be banned from campus for life. So, we gotta ask … whose joke was better, Kimora’s or Dr. Dre‘s?! ?